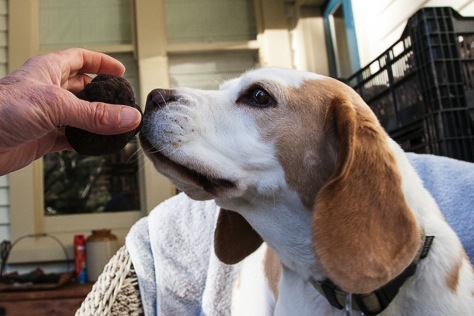 The truffle hound has been on great form, especially when taking visitors out on truffle hunts. Rosie is always charming company, and has never yet sent any winter visitor away empty handed…The very wet autumn and early winter has caused a few harvest problems. We have a babbling brook running through the Perigord black truffiere, which is less than ideal for a truffle that generally likes dry conditions, and grass grub in the bianchetto block coupled with the wet soil has led to an increase in insect-damaged and rotten truffles. But there are plenty more truffles in the ground, and the quality of the best has been very good indeed. There are more Burgundy truffles ripening in the ground at the moment – Gareth counted at least a dozen “push ups” (truffles poking up through the soil surface) last week – so there will be more to come. We have also sold more truffles to Southern Cross Truffles for the production of seedling trees infected with Tuber aestivum/uncinatum, so if you’re interested in having a bash at growing your own there should be trees available in the next year or two. 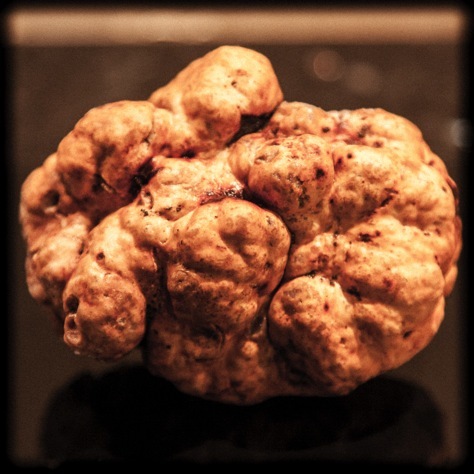 Perigord black truffles: The joke around here is that our truffle production is inversely proportional to the number of trees we’ve got. We have 230+ Perigord black truffle trees, and our black truffle production is only a small fraction of the prolific Burgundy patch. However, this winter’s harvest is already better than last year’s. 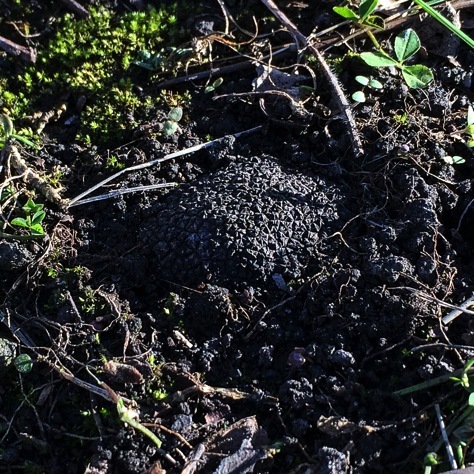 New areas are starting to come into production, and a young (four year old) evergreen oak produced its first truffle a couple of weeks ago – a sign of great things to come in future (we hope – we planted 50 little Quercus ilex from Canterbury Truffles four years ago). The Hermit Ram Limestone Hills 2013 Pinot Noir: Last year’s vintage has just been released, and it’s already drinking well. It will soon be available at Decant in Christchurch and from Whole Bunch Wines in Sydney. Bottles are also likely to arrive in Japan via Wine Diamonds. For more information on availability contact the shy sheep himself, Theo Coles. The 2014 vintage was a real trial: the weather turned to cold custard just as we were hoping for some of the autumn dryness and warmth that’s normal for Waipara. Instead we found ourselves picking in cold and rain, rushing to get the grapes to the winery before botrytis could get into the fruit. There was just under a tonne of good grapes, and the wine’s already showing signs of its limestone pedigree, Theo reports. Other stuff: Back in June Gareth talked to Helen Jackson on her Radio Live Saturday morning show (listen here), and Cosmo Kentish-Barnes from RNZ’s Country Life programme visited Limestone Hills and went truffling with Rosie. You can hear her crunching hazelnuts in the background of the interview. And if you’re keen to learn more about the strange world of international truffle trading, Gareth’s 2008 “Truffle Wars” article for Gastronomica has found its way on to the web.